A nice addition 🙂 Is there a plan to allow for larger capacities – both overall and per-file? Also, in a LAN environment, is the sync’d data kept on the LAN, or does it go out across the Internet? @Shawn in LAN, everything happens locally, it doesn’t go over the internet. I am a little puzzled as to why there would be size restrictions in the LAN setting, though. @Shawn We are having limits during the beta so that we shake out any issues first. This are really great news! Having trouble getting it to actually sync.. is there some trick? or does it take a long while before it actually happens.. ive tried resintalling the sync app with no success..
i should add.. im trying to sync a 100kb jpg file. This is very cool!!!! Thank you!!!! Unfortunetly I can not install the sync app on my main PC, are there plans for a Ubuntu 10.04 64 bit version? Since ther is no SSL Support, Sync is not ‘truly personal’. And relay is not an option, because of slowness. @Frank what issue are you having with Ubuntu 64-bit? It should work. I as well am not able to install on my 64-bit ubuntu. The package manager gives the error of “Wrong Architecture ‘i386′”, although the file is labeled as i686. I already have ia32-libs installed. 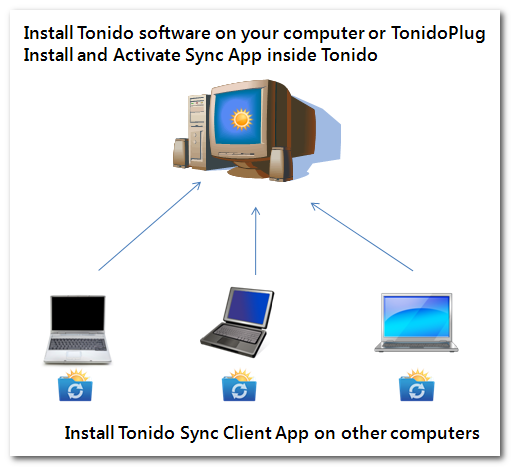 However, I am attempting to install Sync on a computer that does not have the Tonido software on it in order to communicate with my Plug. Perhaps this is the problem. 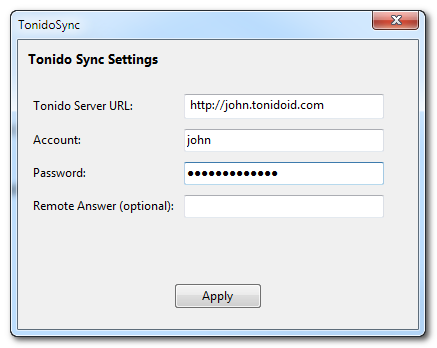 Does sync only work between computers with Tonido installed? no, sync client doesn’t need Tonido installed. In fact it is meant to be installed on a computer without Tonido. Does it work with the force install option in dpkg? If it doesn’t, please post on your forums and we will get it fixed. Did you use -force while installing? Please post in our forum. The app is great! 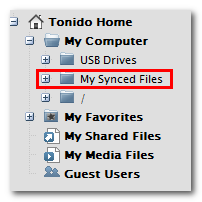 But will there be an option to synchronise any document you want on your computer, not only the tonido sync folder? Unfortunately for me the Ubuntu client will not install on my machines since it is 32bit only and all my machines are 64bit. 1) Am I able to point TonidoSync to my own DNS? So instead of “MYTONIDO.TONIDOID.COM”, I would point to “MYTONIDO.MYDOMAIN.NET:10001”? I am able to do this with most TonidoPlug-related stuff, but with TonidoSync I get an error that I can’t connect to the server. Using my TonidoID.com address works. 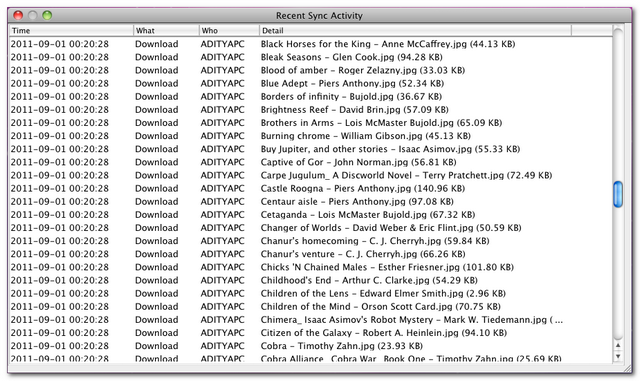 2) How often does TonidoSync sync? I put files in my sync folder on my PC, but I don’t see them show up on my Tonido immediately. @cb You should be able to point to your own DNS. Are you running SSL? Sync frequency is low during the beta. It is about 2 minutes. @madhan: not running SSL, but I can do most things just by pointing to my DNS. when I sync my laptop with my host compute locally in a LAN, I monitor my firewall and saw my hosting computer is communicating with IP address 50.23.224.90, which is tonido server. I thought the sync suppose to be local LAN and no traffic should be going out to Intenet. The first connection is to our service and then it switches to Local if it can. Works great!!! Please turn it into a final version… I need at least 350 mb to mantein all my doc, pdf, excel, etc. sync!!!!. I´m a huge fan!!! Tonido simplify my life. I need no longer to get my pendrive anywhere I go!!! Now I can use it only as a backup!! Thanks guys!!! Looks good however I’m disappointed that you limit the sync to 2GB free / 50GB paid. 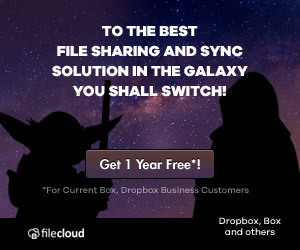 You have the opportunity to compete effectively against Dropbox but you need to hit them at their weak point (2GB storage limit). 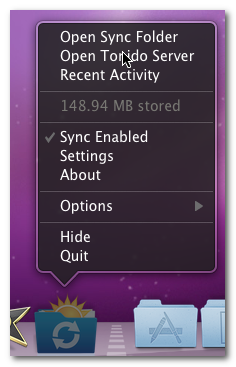 Juts my two cents… not sure I’ll get a TonidoPlug if I’m limited to sync size like that; may as well keep using DropBox. But now, what about a client for Android and IOS? What I really need is to merge this with a backup solution – if only we had a larger limit of at least 400 GB we’d really have a killer solution!